Stephanie Valencia (left), a unit assistant, and Judith Gonzales, a senior unit assistant and the team's union co-lead, go over discharge-related paperwork. Timely follow-up appointments can help prevent costly and stressful hospital readmissions. But making these appointments can prove difficult during hectic hospital discharges, or after a patient has returned home. Even when appointments are made, they aren’t always kept. 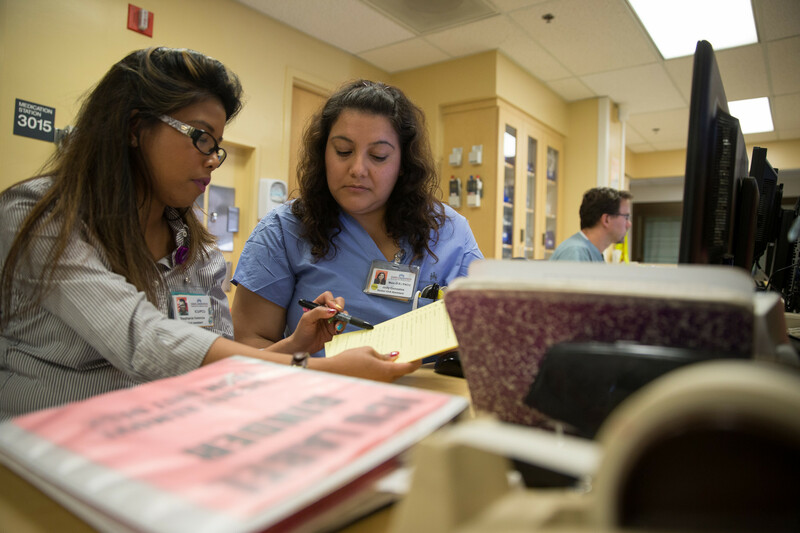 The Unit Assistants UBT at Redwood City Medical Center took on the challenge of increasing the number of follow-up appointments scheduled to occur within seven days after discharge. Team members knew they could increase the likelihood of patients keeping these appointments by working with them and their family support members before they left the hospital. “Obviously we can’t force a patient to go to an appointment, but we can try to make appointments when it’s suitable for them,” says union co-lead and senior unit assistant Judith Gonzales. Starting with one hospital floor, unit assistants spoke with patients before they were discharged, taking notes on which days and times they preferred for appointments, and then passed the written information on to the staff members responsible for scheduling. In eight weeks, the percentage of patients who kept their follow-up appointments jumped from 50 to 60 percent and soon the whole hospital was on board. By January 2014, 86 percent of follow-up appointments at Redwood City were taking place in the seven-days, post-discharge window.